Stumbling into your hotel room, you want nothing more than to take a hot shower and drift off to the sweet oblivion of sleep in crisp, clean sheets. The shower would go a long way to getting some of the reeking stink out of your nose, but you know it won’t be quite so easy to divest yourself of the stain of this evening’s work. You feel marked and marred. You had thought this would feel better—you and the others had won, right? It was finally done. A few brave souls had sacrificed themselves to destroy a threat that had nearly swallowed the world, and it had been worth it. And now, it was supposedly over. As you undo the first button on your coat, you jump at a sharp knock at the door, and some part of you already knows what’s going to happen. You’ll open the door, you’ll be told that the strange rituals haven’t stopped, and your companions insist that you leave immediately on the next ship. You may have stopped one of those things from breaking through, but there would be more. Your days of fighting the darkness are far from over. You sigh and reach for the door. That shower will have to wait. 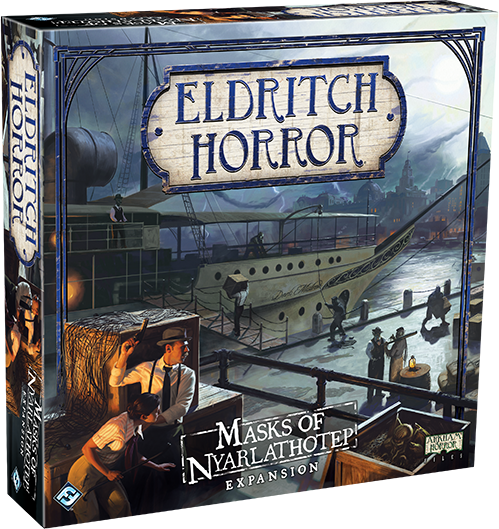 Masks of Nyarlathotep introduces a brand new way to experience games of Eldritch Horror with its campaign mode. Campaign mode sets up a world that's threatened by a continuous onslaught of Ancient Ones, tasking the investigators to undertake six sequential games. Losing a single game to any one of these horrifying forces spells certain doom for mankind, and will cost you the entirety of the campaign. Can the investigators stop this barrage of Ancient Ones from destroying our vulnerable world during this unique cosmic event? You can pre-order your copy of Masks of Nyarlathotep at your local retailer or online through our webstore today! Then, read on for more information. As the otherworldly entities begin their approach, the investigators will feel the effects of the multiple creatures that attempt to rend our vulnerable reality asunder. 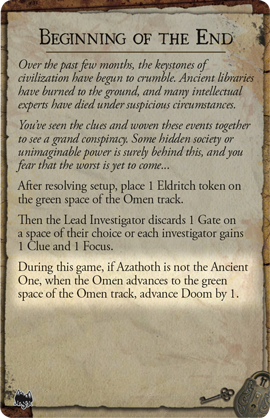 Each game in a campaign begins with two Prelude cards in play: one Prelude for the current Ancient One, and one Prelude for the Ancient One that must be faced in the next game. Though the investigators must focus their energies on averting one Ancient One at a time, their path to victory will be fraught with greater peril as the next threat approaches. In above example, players are setting up a Campaign game where Nyarlathotep is the current Ancient One and Azathoth is the next game’s threat. 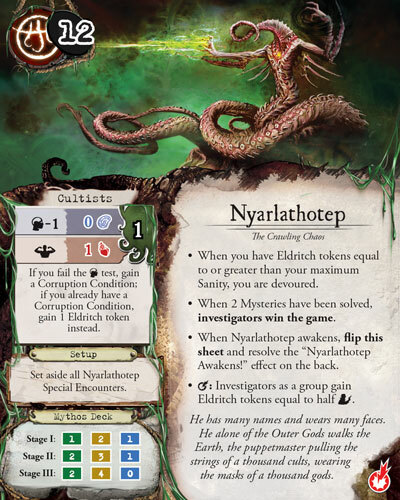 Since Nyarlathotep is the current Ancient One, his Harbinger of the Outer Gods Prelude is used without the Corruption conditions and skill improvements taking effect. However, Azathoth’s Beginning of the End Prelude dictates that the Doom track will move a bit faster with his dread form waiting to emerge in the next game. Even when Azathoth is not the current Ancient One, the impending presence of another Outer God seems to hasten the waking of Nyarlathotep. If the many masks that Nyarlathotep has donned fall away, if the Harbinger’s true form bursts into our reality, would there be any hope for the investigators? Even if the Crawling Chaos is stopped, the investigators will need to contend with Azathoth in their next endeavor to beat back the darkness. And should the beleaguered investigators manage to stop Azathoth, what new horrors await them in their next battle? The investigators will need to plan ahead if they have any hope of lasting long enough to stop six cataclysmic assaults in a row. 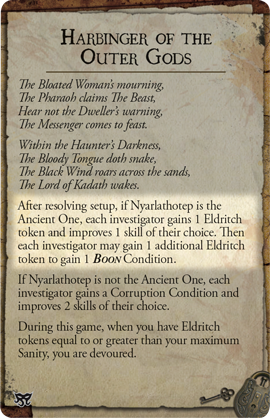 In Masks of Nyarlathotep, investigators can use the Gather Resources action to to gain new Resource tokens. 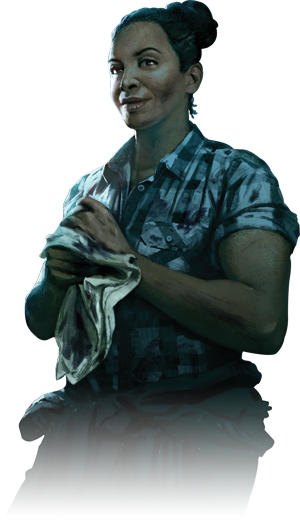 These tokens can be spent to recover additional health or sanity while resting, or can be used to add dice when you're attempting to acquire new assets for your investigators. Gather and spend your Resources wisely to steel yourself against each new threat and arm yourself with the tools needed to continue defending our world. Each battle leaves its mark on the world and the investigators, so some effects, both good and bad, from a campaign’s previous games will carry forward into the fight against subsequent Ancient Ones. If the thrashings of Shudde M’ell should destroy San Francisco, then that once great metropolis, or any Devastated cities, will remain rubble for the duration of the Campaign. Likewise, once an investigator, or an Ancient One, is defeated or devoured, they are eliminated for good, and won’t be able to come back for the remainder of the campaign. 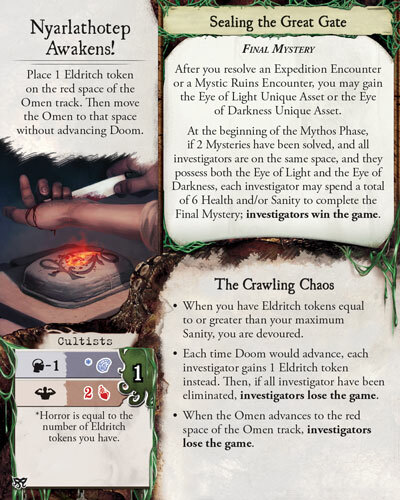 Thankfully, the investigators can also carry the lessons they’ve learned into each new struggle against the Ancient Ones. The Personal Stories introduced in Masks of Nyarlathotep must be used when playing in campaign mode. As mentioned in our first preview, Masks of Nyarlathotep contains Personal Stories for all of the investigators, from every expansion. Keeping a close eye on the goals for investigators both old and new could give you an extra edge for the remainder of the campaign if they gain their Reward early. On the other hand, they may face a permanent hobble if they must deal with the Consequences of their actions. 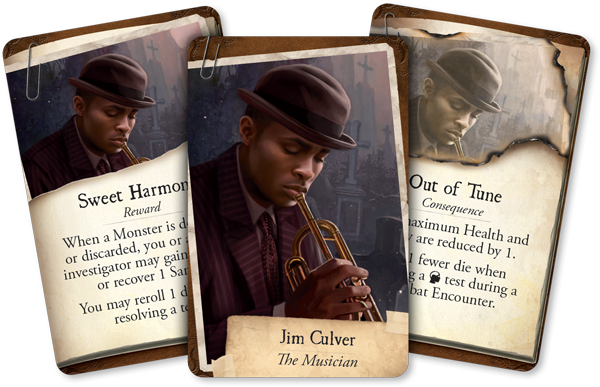 Slay enough monsters, and Jim Culver can play sweet harmonies on his trumpet, getting an extra chance when resolving tests and soothing his own sanity. Unfortunately, if the musician takes too much punishment, Jim will be permanently weakened and find himself struggling to face the monsters that plague his travels. Diana Stanley’s spent enough time with cultists to have learned to fear them. 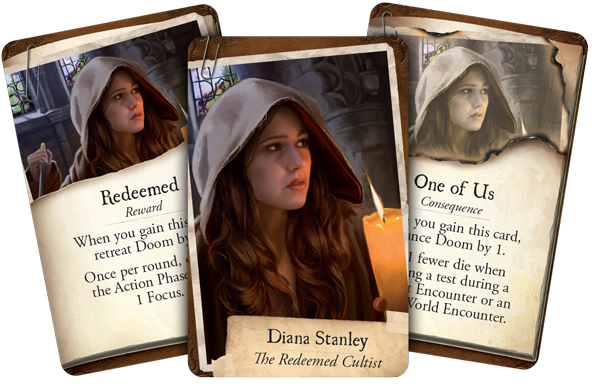 If there are too many cultists on the board, Diana’s Consequence will make it much harder for her to fight off monsters and resolve Other World encounters. However, if Diana can quickly get used to killing the creatures she once sought to summon, she can push back the Doom track and gain Focus every round, making her quite a powerful force when fighting off any Ancient One’s monstrous minions. Gather what you’ll need to survive, guide each investigator to their full potential, and take on a campaign to stop the greatest threat the world has ever known. Ancient Ones gather and rise together in Masks of Nyarlathotep (EH09), available for pre-order from your local retailer or our online webstore!